New Safety Videos to Share! The Bicycle Coalition of Maine has produced two new videos to help teach walking and bicycling safety. The videos highlight the following key points and are appropriate and fun for all audiences! The Maine Walking School Bus (WSB) Program - a partnership of the Maine Center for Disease Control, the Bicycle Coalition of Maine and the Maine Department of Transportation - is excited to announce that Vine Street (Bangor), Abraham Lincoln (Bangor), Farwell (Lewiston) and Riverton (Portland) elementary schools have been selected to receive grants for the coming school years! Congratulations!! The WSB Program provides local schools with the opportunity to start their own daily walking school bus programs, with technical and financial assistance from the statewide program. The funding supports a WSB Coordinator within the school, safety equipment, marketing materials and ongoing guidance from program staff. Vine Street, Abraham Lincoln, Farwell and Riverton will join five other schools across the state of Maine that have worked with the statewide program to launch daily walking school buses: Portland's East End Community School, Norway's Guy E. Rowe School, Ellsworth's Elementary-Middle School, Waterville's Albert S. Hall School, and Bangor's Downeast School. To learn more visit the Maine Walking School Bus website. The Bicycle Coalition of Maine (BCM) honors individuals and organizations across the state each year for the work they do to to make Maine a safer place for walkers and bicyclists. The Next Generation Award is 1 of 8 awards and is awarded to a person who instills a love, interest and appreciation of bikes in the next generation. This years Next Gen award goes to Anne Douglass of Deer Isle. Anne provides annual bike/ped presentations at the local elementary school and runs a bicycle safety rodeo every summer. She hosts "Summer Walks" throughout the warm months and together with Healthy Island Project offers "Active Island", which encourages a healthy lifestyle for all. BCM is impressed by Anne's leadership and efforts to help the next generation stay safe and live well. Congratulations Anne! Learn more about BCM's Annual Awards and read about other award winners here. "Neither snow nor rain nor heat nor gloom of night stays these students from the swift completion of their morning walk to school! The students dependably don their winter gear and head out to face the elements a Maine winter brings. This year has brought much "skating" in boots on the sidewalks. While, we have a few who have decided to ride in the comfort of a warm vehicle, the majority of our members brave the cold and enjoy walking to school with their friends." Have you slipped on ice this winter? Have you put your bike away for fear of crashing on ice? Both accidents are preventable with proper gear - studded bicycle tires and grip spikes for shoes are commonly available and do an excellent job at keeping you upright while walking or bicycling! 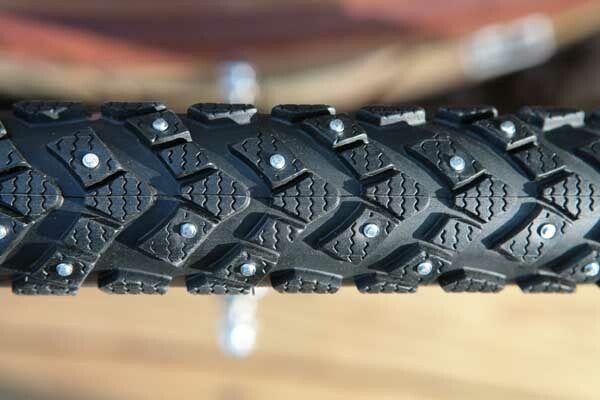 Studded tires are available in all common sizes and can easily be swapped with the current tires on your bike. Check out your local bike shop, if they don't have them in stock they will order them for you. Footwear grips come in many varieties, ranging from small traction knobs to large aggressive spikes. Your local outdoor or athletic store should have a selection of them for sale. The Walking College is an interactive, online educational program for walkable community advocates. A Webinar will be broadcast at 2pm Tues, Feb 14th, to provide information and answer your questions. Learn how professionals in public health and transportation can work together to create streets that are safe and convenient for all. Learn how walking can be prioritized in communities of all types and be inspired with tips of how walking can be incorporated into the daily routine of every individual.